When I first lost my dad, people asked me all the time how they could help me. When a little time had passed and people knew I was comfortable talking about it, they’d ask me how they could help others in their lives who were grieving. I actually did some research by asking many people I knew had lost people recently and not so recently. I don’t have heaps of wisdom or advice, but I’m going to share what I do know. I meant to write this a long time ago. A long, long time ago when my grief was still really fresh. Little did I know it would get “fresh” again the closer the year mark and holidays get and be a perfectly timed reminder and therapeutic thing for me to write. The biggest thing to know and remember about grief is that every person grieves differently. Therefore, the number one thing you have to do is ASK. Yes, grieving people are fragile, but we’re not as fragile as you think we are. Asking us how you can help us is not going to make us break into a million pieces. We might cry when you ask, but you can handle it! Just hug us, or pat us comfortingly on the back, or just sit there. We’ll stop crying eventually and be able to tell you. And, we might not even cry in that moment! 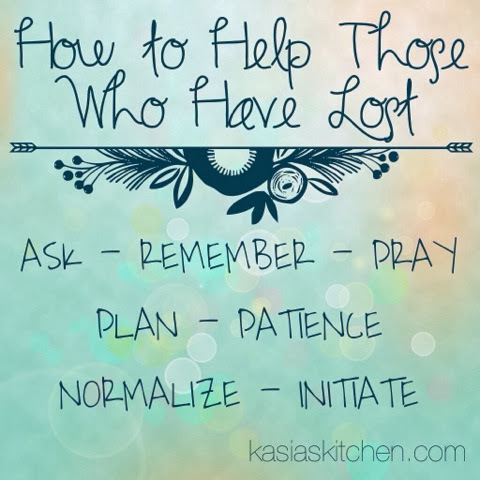 Asking a grieving person how you can help them, actually meaning it, and waiting for an answer, is the best first thing you can do. Some people want to be alone. Some people want people there. Some people might want you there while they cry. Some people might want you there to do something that feels normal and gets their mind off things. Some people might need you to bring them a meal. Some people might need you to watch Netflix with them. Some people might need you to make them get up and fix their hair. It changes. It’s not a cut and dry cycle. In the first weeks, lots of people will be around. Lots of people will care. Lots of people will help. But as the time passes, the helping and caring people fade. And grief, though it may change and go in and out of tougher cycles, it doesn’t fade as quickly as the helping and caring people do. If you have a friend that you genuinely care deeply about and want to walk with them through this hard time, I think the biggest thing you can do is to remember that it’s not over for them. All these suggestions are for expected grief moments. There are two different kinds of grief moments. The expected and the unexpected. Since the unexpected are, well, unexpected, it’s hard to plan for them! But I have a theory that if we plan for and have people who intentionally care about our expected moments, it will be easier to reach out to them when the unexpected, sometimes even harder, moments hit. Get out your calendar and remember the important and more difficult days with and for them. Grief comes in moments and memories, but for a lot of people it also comes with dates. They might reach out to you when overwhelming moments come from unexpected moments and memories, but every person I asked, male, female, old, young, new loss, old loss, said they would never get angry or be annoyed if someone remembered their hard days. And, if you intentionally remember these expected grief times with them, they are more likely to reach out to you when the unexpected grief hits. My dad died on November 18th. November to January was awful. For the first 6 – 8 months the 18th of every month was hard. I learned to expect it and know it would be hard. The 11th month was the first month that the 18th didn’t get to me. I’ve been told that after the first year, the monthly anniversaries aren’t hard, but the big expected ones continue to be difficult days. Do unexpected grief moments still come? Yes! And there simply isn’t anything any of us can do about those. But remembering the expected ones means a lot to someone who has lost. What can you do on those days? Nothing fancy is required! One of my best friends asked me early on how she could help and be there for me from afar (she lives in Georgia, I live in Mississippi). She added the 18th as a monthly reminder. On the 18th of every month faithfully this year she has text me and simply told me she knows what the day is, is praying for me, and asked me how I was. It meant the world to me! It wasn’t fancy, but it was perfect. Simply letting them know, “hey, I know what today is, I know it might and probably will be a rough day, and I’m thinking about you,” means so much. On Father’s day my friend helped my other friend who lost her dad this year also and I host an intimate dinner party where we cooked our dad’s favorite things and invited “safe” people to remember them with us. Another person I asked questions to about her grief, said on her dad’s birthday she often asked friends to go out to eat to celebrate his memory. For holidays, make sure they have places to go. Help them come up with a proactive plan to make it through the holiday season, especially in the first couple of years. Grief is magnified during the holidays because it was often the time you saw your loved one most. Also help them proactively plan for the year anniversary and other years if it’s still hard. That’s not just from me either! It’s from multiple counselors. Being proactive is the wisest thing a grieving person can do. If they can’t be proactive on their own, help them come up with a plan. On the weeks and days leading up to the big hard days (especially the first year anniversary, feeling the effects of how hard that one is now), check on them. Pray for them and let them know you are praying for them. Be patient with them! They probably already feel like they are being a burden and that everyone else thinks they should be more okay than they feel. Let them know it’s okay! Make them feel like how they feel is normal. Don’t expect them to come to you. They might! But they also might not have the emotional strength. Go to them. Initiate. And lastly, I can’t stress patience enough! I like words and quotes, so naturally I’ve googled “grief quotes” a lot. One quote that I didn’t quite agree with says the grief doesn’t change you, it reveals you… How I hope that isn’t true, haha. I’ve been a mess at many different moments throughout this year. I was mean to people. I forgot how to filter my thoughts and feelings and just spilled them all out to everyone, pushing many people away. I was destructive at different times. I’m not how I was before I lost, but I’ve figured out how to be balanced again. Be patient. If they are mean to you, they probably don’t mean to be. If they are making bad choices coping with their grief, help them find their way back to truth and non-destructive ways in love, not condemnation. Don’t give up on them. Be patient. Ask. Remember. Pray. Plan. Patience. Normalize. Initiate. And in case you need inspirational motivation or a reminder of why you should care and/or do this for the people in your life, scripture is full of them. God had a heart for orphans, widows, the fatherless and the mourning, we should too. And in an effort to be transparent and vulnerable, I do ask for your prayers. Today is November 14th, November 18th is in four days. I feel it. Every day closer is heavier. I am struggling with default defense mechanisms to be destructive and numb pain. Before noon today I had already had two of those unexpected grief moments and had to just let the tears fall like they needed to and then was fine. Not that death is ever or can ever be timed well, but my loss happens to bleed in to the holidays and most of my big hard days are all grouped together. Maybe it’s a blessing to have them so concentrated and not so spread out. Nonetheless, still pray for my brother, my step mom, me, and all the people in your life who have lost. If you have lost, please share your dates with me! I’d love to be able to pray for you and encourage you on your expected hard days.